This is Lossit Bay on the west coast of Islay, one of Islay's hidden treasures. I had walked up along the coast from near the former wave power station in June this year. A very nice walk with great views over the quite dramatic coast along this part of the Rhinns of Islay. When I arrived I had the beach almost to myself, only a young couple with their young daughter was there as well. We had a nice chat, then I had time to explore the beach. 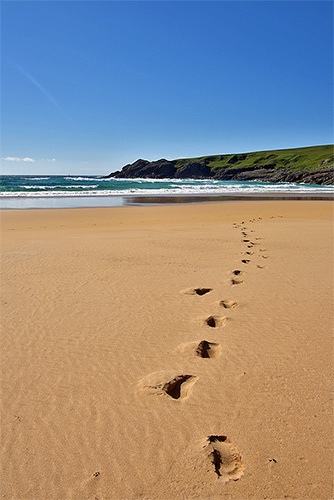 With the beach mostly untouched I could leave my own footsteps, to be washed away again with the next high tide. That's all I've got for tonight, it's time to get to bed, get some bank holiday sleep (whatever that is). Good night and have a great (bank, if you're in England, Wales or Northern Ireland) weekend.